From time to time, Los Angeles County Sheriff's Department (LASD) Chaplain Tony Miano tells the famously funny "dog bite" story friends and supporters of 10-4 Ministries are familiar with. It is one of a few in this Deputy's life that reveals the heart of this down to earth and amicable Police Chaplain as he traverses the hazardous road of a Christian in law enforcement. As director of 10-4 Ministries, Chaplain Tony has now crafted another outstanding spiritual resource to add to the war bag of the Christian community in the field. 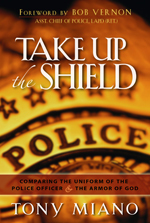 Chaplain Tony's new book, "Take Up The Shield," a unique publication that compares the various pieces of law enforcement equipment to the spiritual armor that the Bible describes in Ephesians chapter 6, further reveals the heart of a Christian man who has learned through experience in this dangerous field the critical importance of "putting on the whole armour of God, that ye may be able to stand against the wiles of the devil." (Eph 6:11) What is uncommon about this distinctive publication, where most are written by retirees drawing off past experience, Chaplain Tony works more than 120 hours a month as an active duty patrol deputy and serves as chaplain—ministering to the needs of peace officers, on the streets. As a non-sworn member of the community in support of the LE community, with active duty cops who are dear friends and corresponding with many across the nation as they face myriad challenges, knowing a hard-charger like Chaplain Tony is out in a radio car and immediately accessible to the men and women of the LASD is a great blessing. Too many cops do not have access to experienced ministers like Chaplain Tony. "Take Up The Shield" will be a great ministry resource in lieu of that. What is more, this book is not written so much by a cop, but by a Christian who is Spirit-filled and not ashamed to share his faith and point people to the Lord Jesus as Savior. From a suspect in the back of his patrol car, to a first time youth offender being delivered into the custody of his parents at the front desk of the station, Chaplain Tony exercises personal initiative in exploiting every opportunity to present the Gospel to those most in need. It was the Lord Who said, "...They that are whole need not a physician; but they that are sick." (Luke 5:31) The Christian men and women of law enforcement are, more than anyone else in the Born Again, Spirit filled Church, on the point in dealing with the corruption and despair of American society, and that being so, are critical players in the ongoing, daily outreach to this society by the Spirit of God. Chaplain Tony, in "Take Up The Shield," models that beautifully. That being said, Chaplain Tony’s book is a wonderful ministry resource for anyone to put into the hands of someone they know who is facing trials and hard times. Someone who has “been there, done that” in the daily mental and spiritual combat of contending with contemporary life in America, like Deputy Miano, is qualified to counsel anyone, in law enforcement or not, in prevailing through applying the spiritual truths of the Bible and the promises of God to overcome. Furthermore, a lot of the conflict in our society between law enforcement and the citizenry they are sworn to protect is the lack of communication and understanding between the two camps. Law enforcement is an exclusive, isolated field, a mysterious, dangerous career choice that many citizens don't fully understand. That mystery leaves a vacuum of understanding in the minds of many people when law enforcement is thrust into the national media spotlight during controversial times and events, a vacuum that exploiters and special interest groups are more than willing to fill up with lies. Chaplain Tony’s approachable and good natured tone tears down those walls. at the 10-4 Ministries website! 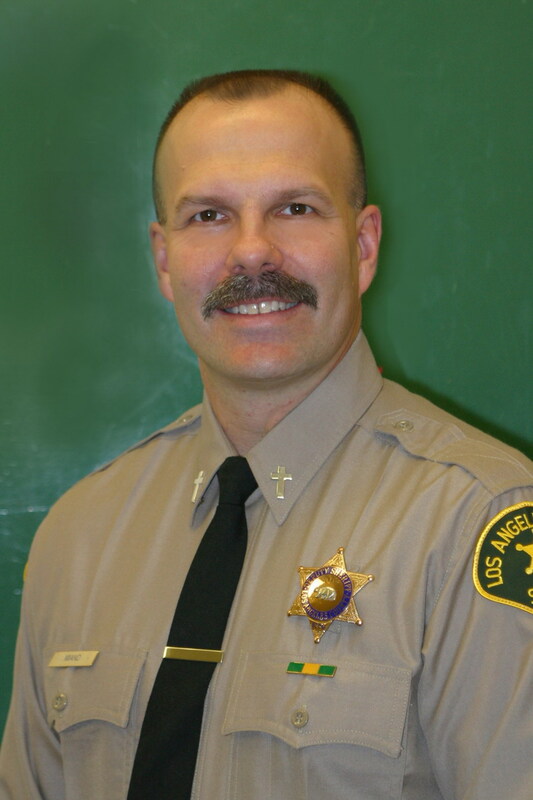 Tony Miano is an 18-year veteran of the Los Angeles County Sheriff's Department (sworn and reserve), where he presently serves as a department chaplain. He is the founder and director of Ten-Four Ministries, which provides practical and spiritual support to the law enforcement community. He frequently speaks at churches, law enforcement fellowships, and chaplain conferences. Tony and his wife live in Santa Clarita, CA, with their three daughters. Click Here To Return To Salem The Soldier's Page! All personal articles © 1999-2008 Michael A. Baker. This material is copyrighted to prevent altering or reproducing for profit. Permission is granted to the reader to forward all writings from "Salem the Soldier's Homepage/Michael A. Baker," without altering, to friends, groups or other ministries or to copy for similar or personal use. Chaplain Tony Miano can be reached at his email for assistance!